Orthros, Great Hours, Great Vespers and Divine Liturgy of St. Basil. Orthros and Divine Liturgy of St. John Chrysostom. The Young Adults and GOYAns of our parish will join our chanters in singing the Christmas Eve evening Liturgy. 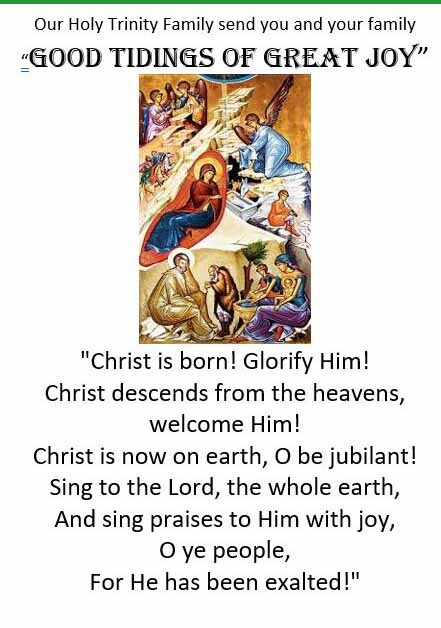 On behalf of Father George and our Holy Trinity Parishioners, we look forward to welcoming you, as we wish you a blessed Nativity of the Lord and New Year 2019.